Could you please tell us a bit more about your career inside Zclassic and explain us the reasons why you wish to create Zen ? The ZClassic project has been a lot of fun and brought together a dynamic community already. Since we spoke last month we’ve had a lot of action in the markets supporting our project, with a big jump in market capitalization. That’s been a positive signal that people out there like what we’re doing and enabled some of our core team to break away from their day jobs to take on ZClassic and Zen full-time. We’ve been able to add Rolf Versluis, a professional miner, successful entrepreneur, angel investor, and former nuclear engineer to join our core team. He’s a really smart guy (obviously) and has added a strong management layer to make us more efficient and keep us moving forward aggressively. On the technical front, our lead dev, @movrcx, just released a new graphical wallet for Windows using Electron (Eleos), so we’re continuing to improve the user experience. That’s a fair question and the reality is that our combined resources have tilted towards Zen recently to prepare for launch next month. There’s a ton of work to complete in a compressed window, so we made a strategic decision to rotate resources to Zen in the short run. That said, now that the project has full-time support, we’re back to active development and community outreach for ZClassic. That’s evident in the new Eleos release this last week. Our group is still fully committed to both projects and as we grow the community, we expect to have sufficient resources to develop each in parallel. What are the main differences and strengths of the Zen project versus others ? Why do you consider it as particularly innovative with plenty of promises ? Zen is exciting for many reasons. We’re integrating best-in-class technologies in a novel way that solves important social and economic problems. Fundamentally, Zen is an end-to-end fully encrypted network over which data and value can propagate or be stored without censorship. We’re solving the privacy issue other blockchains bump up against in that their networks are vulnerable to traffic correlation that can fingerprint users. We do this in a number of interesting ways, such as employing domain fronting techniques, implementing AES encryption to reside within z-transactions, and enabling perfect forward secrecy handshakes between public keys, etc. That’s just the fun technical stuff. The social and governance aspects of Zen are just as exciting and work towards the type of peer-to-peer system envisioned by Satoshi. One of the biggest changes is in how we split block rewards: Miners still retain most of the block rewards, but we’re also paying full node operators who comply with our security standards (which should significantly decentralize our network), a DAO for funding growth projects, and our Core Team to maintain the project and operate a legal entity. Zen is growing fast. At our core we have three founders (@movrcx, Rolf Versluis, and myself), but we have over a dozen other internal members leading key functional areas, such as infrastructure, development, strategy, outreach, project management, etc. We’re structuring as a decentralized startup and have even begun spinning up an Asia-Pacific (APAC) division to focus on fintech integration with strategic partners in the region. Despite all the support so far, as we gain momentum we’re finding it hard to keep up and so we’re always on the hunt for new talent. If you like what we do and want to help, we’ll find a role for you! 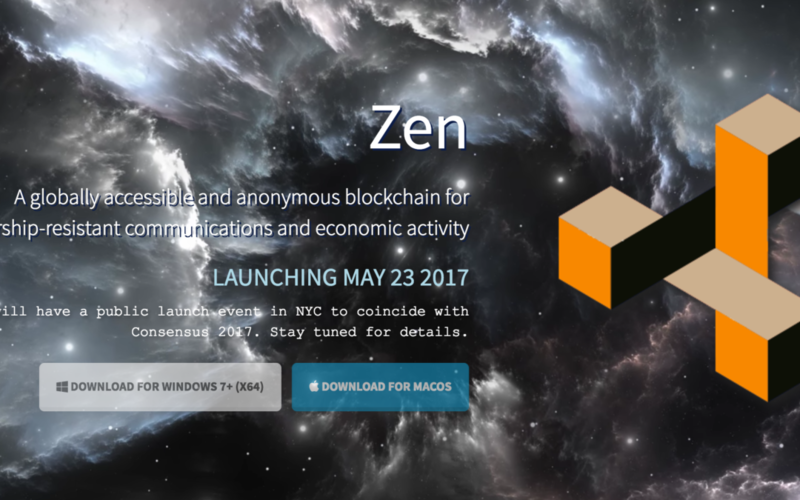 What are the development projects for the Zen project? Messaging, creating a market platform? Right now we’re working on TLS v1.3 end-to-end encryption support, domain fronting techniques, extending RPC to enable AES encrypted data to reside in shielded transactions and perfect forward secrecy handshakes between public keys, integrating anonymous « chat room » support into the blockchain using zk-snarks, and integrating IPFS/GnuNet into the graphical wallet to enable anonymous content-centric browsing (think Tor-style hardened browser). What are the main objectives of Zen for 2017 ? Our first goal is a successful launch on May 23rd! There’s a ton of work to do between now and then, but we’re on track and have a vibrant team pushing forward. Other than the technical developments mentioned in previous questions, which are big in themselves, we’re focusing on standing up a global decentralized startup with balanced governance from all stakeholders. Just standing up the DAO, the core group, voting on growth projects, and implementing successful elections will all be big events for us. Have you planned a partnership with Z classic, like for example the use of Zclassic inside the applicative environment of ZEN ? That’s a great question and don’t fault me for stealing your idea! Our communities will always significantly overlap, so we’ll certainly have plenty of crossover, partnerships, integrations, etc. At the moment it’s still too early to tell exactly how that’ll work out, but one simple example would be ZCL support for any internal Zen markets. We often heard speaking of 2 topics regarding the crypto currencies : governance issues and economical models. What are precisely those two as far as Zen project is concerned ? As I’ve alluded to already, Zen has a Core Group and a DAO to separate powers, authority, and functionality. Each entity has its own independent budget, officers, and plans. Protocol will specify interactions between each and we’re also going to have direct stakeholder voting for officers and on specific issues. The goal in all of this is to figure out how to run a decentralized organization with the right mix of efficiency and limitation on powers so that no one stakeholder can hijack the entire system. We don’t have all the answers a priori, so we’re designing the system to be flexible so that it can evolve as we learn more, but only up to some boundary to prevent capture. 4,3% will be rewarded for the development of the Zen project. Is it also plan to help the Zclassic community for the maintenance and the development of the project ? No, the 8.43% reward is taken from Zen block rewards and will remain in the Zen project. This is actually one of the major reasons we’re launching Zen and as a complement to ZClassic; the ZClassic community will remain the traditional open source project supported by volunteers and donations, while Zen will operate more like a decentralized startup with funding. It’s just a different way of doing things and both have their merits. You speak about nodes and nodes rewards. What will be the purpuses of these nodes and do you have already and idea about the number of Zen needed for a node and to participate to the project governance? One of the big problems with see with so many cryptocurrencies is that they only reward miners. Miners perform a tremendously important function, but there are other valuable stakeholders. Full node operators who are not miners also contribute a great deal to network security by validating transactions and maintaining full copies of the blockchain. Zen will reward these stakeholders directly. It’s not yet set in stone, but we’re thinking of requiring a nominal 42 Zen in addition to meeting a variety of security and hardware requirements to qualify as a compensated full node. The node reward is 3.43%. Why this value ? Do you consider it as attractive enough ? 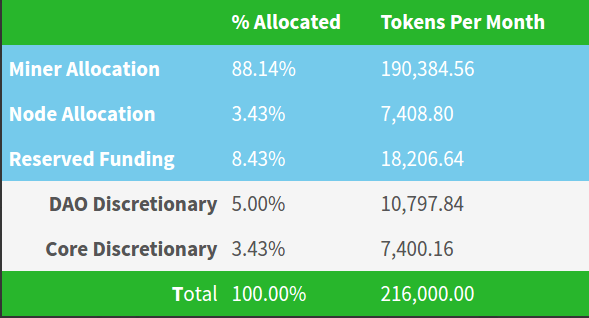 We based this percentage on working to determine what percentage of mining rewards would provide us with thousands of Secure nodes worldwide and a sufficient set of resources to fund growth. As Zen grows in use, the requirements and costs of operating the secure nodes will increase. With compensated Secure nodes as part of the system and protocol, we are able to use the distributed computing power to perform other functions that Zen requires, such as creating a Voting consensus, managing distribution of mining rewards to Nodes, Core, and DAO. Many questions are raised today in regards of the governance and the economical models of crypto currency world. Dash and PIVX have a strong marketing strength which reveals on the one hand the power of their governances but on the other hand the risk of masternode centralization. What is your opinion on this ? You raise an excellent point about the power of good governance and funding continuous development. This has been the big lesson in cryptofinance for 2016! Bitcoin will go down in history as one of the most innovative and liberating inventions, but it isn’t perfect; it’s tough to make something perfect right away. We’re learning a ton from the bitcoin experiment, both good and bad. Some of the biggest lessons are that all stakeholders need to be enfranchised, and everyone should be rewarded for adding value to the network. Another big lesson we’re seeing is that what we’re calling “decentralized” projects are often turning into highly centralized networks. One of our big goals is to counter that process of centralization by directly subsidizing both miners and Secure Nodes. That’s exactly what we’d like to see; Zen as a sort of network, or platform, into which other projects can integrate. Zen governance, however, particularly funding for Core and DAO will be strictly used for Zen projects. For instance, Core funding will go to the Zen legal entity that’ll be our public-facing entity, and DAO funding will go towards growth projects. However, there will certainly be positive externalities from Zen that spillover to ZClassic. As a member of the Zclassic development team, how do you consider the dynamism of the Z classic community, as far as the governance and the employment of new devellopers ? From my perspective so far, we’re one big community working on two projects. I hope it always stays that way and we grow symbiotically. The last three developers I’ve brought on board were pitched on both ZClassic and Zen; I’ve yet to make a distinction and don’t intend to do so. Zen will have direct funding, but priority will always be made for projects that can port over and support both chains. What do you think of the partnership of Ethereum with Zcash and of the integration of the zero knowledge technology inside Ethereum ? Isn’t it in your opinion a competitive risk for Zclassic and zen ? I love it! What we’re all doing provides enormous social good and so I encourage and support any developments in this area. The Ethereum-ZCash partnership is huge and we’d love to see something similar with ZClassic and Zen. Competition makes the world better, and you can bet we’re looking for similar partnerships. What do you think of the current issue with the bitcoin and BTU and its conflicts inside their comunity ? How do you see their future ? The conflict is overrated. Bitcoin has survived much worse and will survive this. I also think the risk of a hard fork is minimal, and I’d say the market seems to agree despite all the rhetoric. Bitcoin price is still a good 30%-40% above its 200-day moving average, so despite all the headlines and debate, few seem to be expecting chaos. Just seeing all the buzz with my students and others at my university, bitcoin and cryptocurrencies have a bright future!